Smiles everywhere as the band conclude their last item. YOU probably already know about the celebrated St Joseph’s Secondary School Band and their big victory at the German Music Festival in Chemnitz, Germany earlier this year. 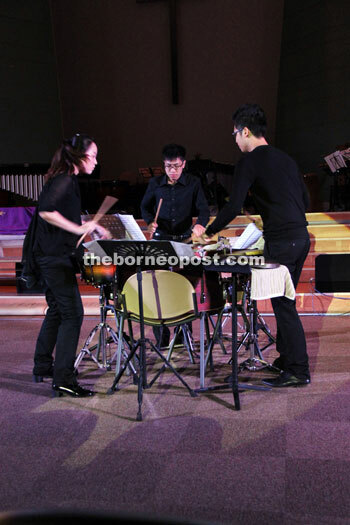 You may have heard about the amount of sweat and tears shed by each member in order to produce the kind of sound and professionalism that could only have originated from some of the top percussion orchestras to grace the international stage. TRIO PER UNO: BAM! Percussion Trio playing the first movement of Nebojsa Jovan Zivkovic’s Trio Per Uno. You might even be a parent of one of these musicians, never having to worry about how to keep your child occupied and out of mischief during the school holidays. 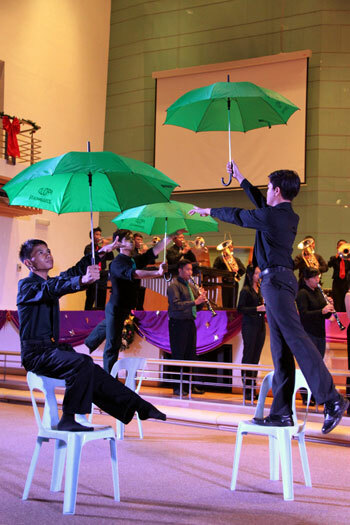 You might have been there on Dec 15 when St Joseph’s School (SJS) toasted the 131st anniversary of the school with a time-honoured way of celebration — an offering of music, the kind that would be right at home on international soil as it was in Trinity Methodist Church, Ellis Road, Kuching. RIGHT ON CUE: The SJS Band Colour Guard performing to Beethoven’s Five Secrets, The Piano Guys’s mashup of Beethoven’s 5th Symphony and One Republic’s Secrets. With 16 items on the programme, the night could have been consumed by the same problem that has plagued many other concerts but programme coordinator Jonathan Fox kept it varied and interesting. The show kicked off with Chris Crockarell’s Me Tarzan which featured the always-fun body percussions where the percussionists used nothing but rhythmic clapping and stamping to ‘play’ this composition. This was followed by the full SJS Concert Band playing Dedication, March and Celebration, composed by James Swearingen. EYES OPEN: The Colour Guard during ‘Eyes Open’ from The Hunger Games. The first of the featured SJS Band Staff soloists to take the stage was the school bands music director and arranger Anthony Wong, who performed Melody (In Search of a Musical) on his alto saxophone, supported by the band. The next number was also a solo — A Trumpeter’s Lullaby by wind coach Yap Thien Soo — on his trumpet. The SJS Band Colour Guard then made their first of three outings. Armed with mock rifles which were later replaced by flags, the boys danced and spun with the grace and dexterity of dance-theatre performers. Their soundtrack was Beethoven’s Five Secrets, which was the composition that happened when The Piano Guys put Beethoven’s 5th Symphony together with One Republic’s Secrets. The concert this year featured BAM! Percussion Trio. Formed in Singapore by three first-year Yong Siew Toh Conservatory of Music students, they make their Malaysian debut at 131 years of St Joseph’s School: A Celebration in Concert. BAM! consists of Shi Boya (Malaysia), Joachim Chin (Singapore) and Nguyen DuyAnh (Vietnam). Performing their respective solos was serious business, if their focused facial expressions were anything to go by. But when they came down to the floor for the first movement of Nebojsa Jovan Zivkovic’s Trio Per Uno, it was an obvious crowd-pleaser with their showmanship and precise timing. Another clear highlight of the evening was when Jonathan Fox picked up his mallets and showed the hall full of audience exactly how many tones a master can coax out of a full set of timpani. Accompanied by the band percussionists, he led the group in John Beck’s Concerto for Timpani and Percussion Ensemble. Fox now serves as principal percussionist of the Singapore Symphony Orchestra. Because a percussion concert can be hampered by re-arranging heavy instruments between sets, we were treated by an impromptu performance from SJS band director June Ling on the piano, together with Anthony Wong on his saxophone and Yap Thien Soo on his trumpet. The Colour Guard made their second appearance to Taylor Swift’s Eyes Open from the soundtrack of The Hunger Games. The band followed this with a David Shaffer arrangement of Amazing Grace which triggered awe as if it was a bulb at the end of a light switch. The full cast finished with Celebration from Kool & The Gang which we got to enjoy twice due to a demand for encore. 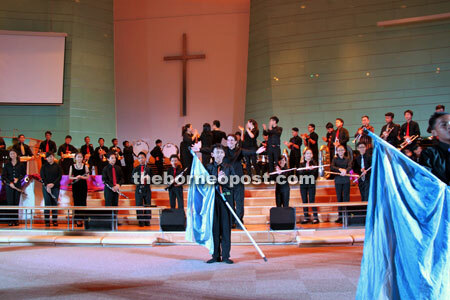 The St Joseph’s Secondary School Band consists of students aged between 12 and 16 years from SJS, St Joseph Primary School Kuching, and St Joseph Private School. I hope these young but formidable musicians (and their parents) are aware of how ridiculously talented they are, and how the possibility of seeing them perform in some of the great orchestras in the world is within grasp. 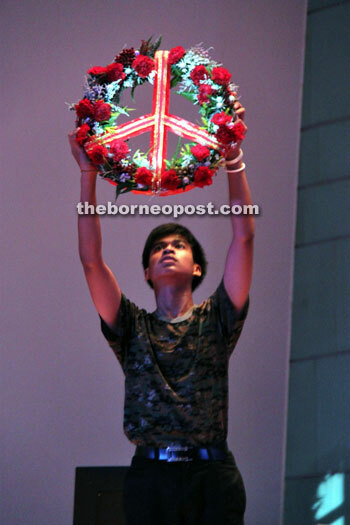 The concert was this year’s community concert, making it their fourth since they started giving back to the communityin the form of both service and high-calibre performances. I think those who attended will agree that this, with the seasonal festivities looming, was also nothing less than a priceless gift.